"Rodeo Capital of the World"
National Park's East Entrance, Cody Wyoming is regarded as the Eastern Gateway to Yellowstone Park, but because of all the fascinating things Cody Wyoming has to offer, it stands on it's own as a top vacation destination, with our without Yellowstone National Park near its doorstep. 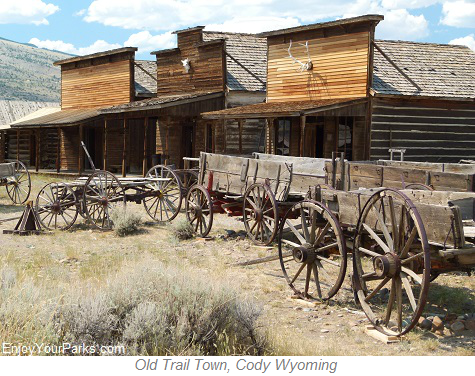 The illustrious western history that surrounds Cody Wyoming (population about 9,000) is evident everywhere you turn, and the more you learn about Cody's amazing past, the more you fall in love with this very special place. Founded in 1896 by Colonel William F. "Buffalo Bill" Cody, Cody Wyoming is known as one of the "preferred gateways" to Yellowstone Park. However Cody Wyoming's world-renowned western hospitality, in addition to its incredibly popular attractions such as nightly rodeos, cowboy music, gunfight re-enactments, historic downtown and the world-famous Buffalo Bill Center of the West, Cody Wyoming is....as we initially stated.... is one the greatest classic western towns in America. 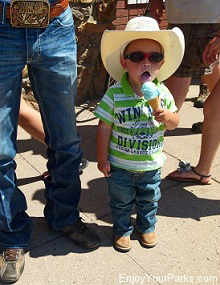 Buffalo Bill Cody Stampede Rodeo, Cody Wyoming. 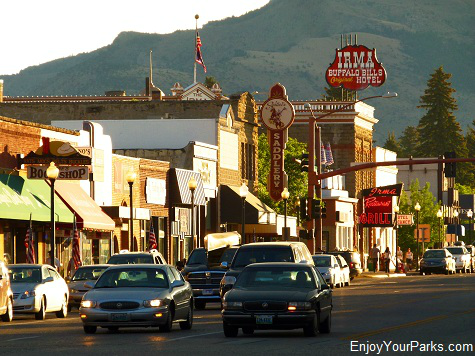 In addition to the amazing "living" history found throughout Cody Wyoming, this world-famous western town provides exceptional dining, shopping and art galleries, as well as a huge array of accommodations, ranging from rustic cabins to plush, upper-end lodging. And the outdoor opportunities that the surrounding mountains, lakes and rivers provide visitors are seemingly endless, as this entire area is an outdoor enthusiast's dream come true. Three stunning scenic byways near Cody Wyoming take visitors into the heart of gorgeous mountains and rivers, where rock climbing, mountain climbing, waterfall ice climbing, hiking kayaking, fly-fishing, hunting, horseback riding and river rafting are among the many activities this magnificent area provides. Colonel William F. Cody founded Cody, Wyoming in 1896 at the age of 41. Known world-wide as "Buffalo Bill" Cody, this western icon was a living legend and one of the most famous people on earth. Born in the Iowa Territory on February 26, 1846 in Le Claire, his family moved to the Kansas Territory several years later, where he started working at the ripe old age of 11. At age 14, Buffalo Bill Cody became a rider for the Pony Express, and during the American Civil War he served the Union Army from 1863 until the war's end in 1865. Buffalo Bill Cody then served as a civilian scout for the U. S. Army during the Indian Wars of the Great Plains, and received the Medal of Honor in 1872 because of this efforts. 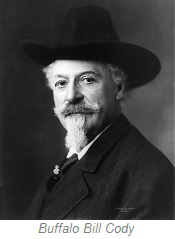 The Origin of the Name "Buffalo Bill"
in a year and a half during the years of 1867 and 1868. William F. Cody and other well-known buffalo hunter William Comstock allegedly competed in an 8-hour buffalo shooting match over the rights to the name "Buffalo Bill", and William Cody was the victor after killing 68 buffalo to William Comstock's 48. Comstock a well-known scout, hunter, interpreter, and was park Cheyenne Indian. Each competitor used completely different hunting techniques and completely different rifle designs. That story in itself is fascinating, but we won't get into details here. Once the competition was over, William Frederick Cody was then forever known around the world as "Buffalo Bill" Cody... one of the most famous names of the Great American West. 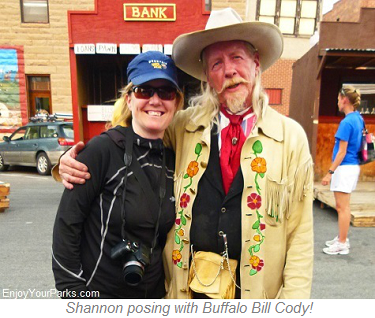 While visiting Cody Wyoming, you might even run into Buffalo Bill Cody in front of the Irma during the afternoon "Old West Shootout". He looks as good as ever! road in 1883. The show depicted scenes of cowboys and Indians, and re-enactments of well-known occurances of the frontier days and Indian Wars. And several of the "actors" in the tour company were actually real life western icons, such as the legendary Chief Sitting Bull. 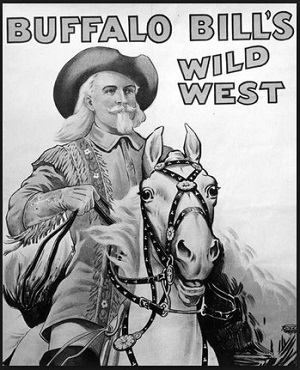 The "Buffalo Bill's Wild West Show" gained overnight success, and this huge tour company pitched its tent throughout the United States in cities such as Chicago and New York City. Word quickly spread of this amazing and entertaining show throughout Europe, and in 1887 Buffalo Bill took his show to Great Britain and Europe. With the tremendous success of Buffalo Bill's Wild West Show, William F. Cody not only became hugely world famous, but also became quite wealthy... and his focus on the Cody Area became stronger than ever. Buffalo BIll Cody first came through the Cody area in the 1870s, and ever since was extremely interested in the development potential of the area, largely because of its close proximity to Yellowstone Park, as well as the economic possibilities arising from irrigating the rich soil of the valley. Adding on top of that, the amazing scenery of the surrounding area, and the excellent hunting available in the area, Buffalo Bill Cody strongly felt that the area had tremendous development and income potential. 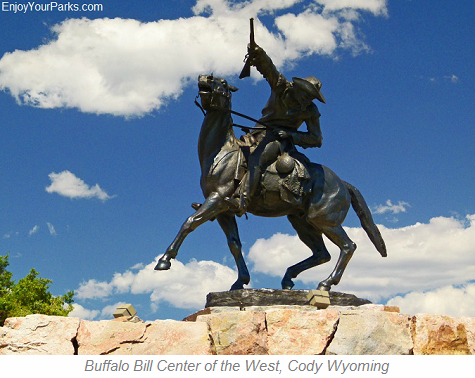 Therefore Buffalo Bill Cody returned in 1895 to initiate the building of Cody Wyoming. 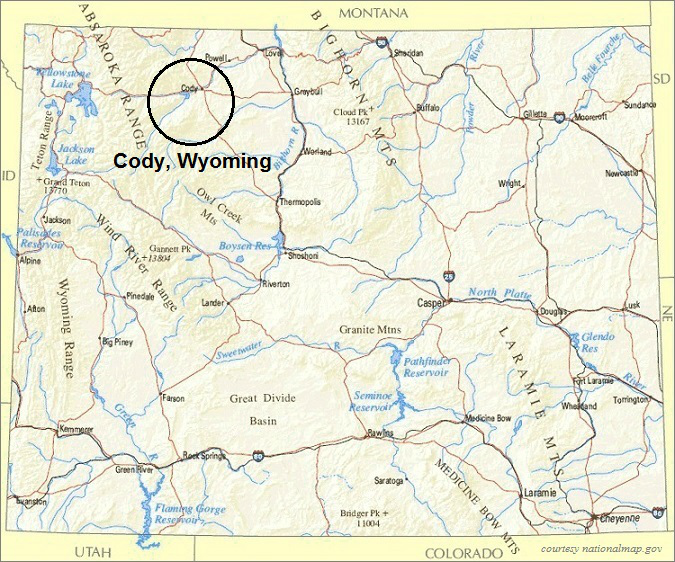 The town of Cody, Wyoming was officially incoporated in 1901, and many of the main streets of Cody are name after his business associates, such as Alger, Rumsey, Bleistein, Salsbury and Beck. wonderful western hotel, they will see that many of the rooms are named after some of the famous and/or legendary people who stayed at the Irma through the years. The Irma Hotel is a stone structure and was designed by a prominent architect from Lincoln, Nebraska by the name of Alfred Wilderman Woods. The exterior walls are made of locally quarried sandstone from Beck Lake, as well as local river rock. 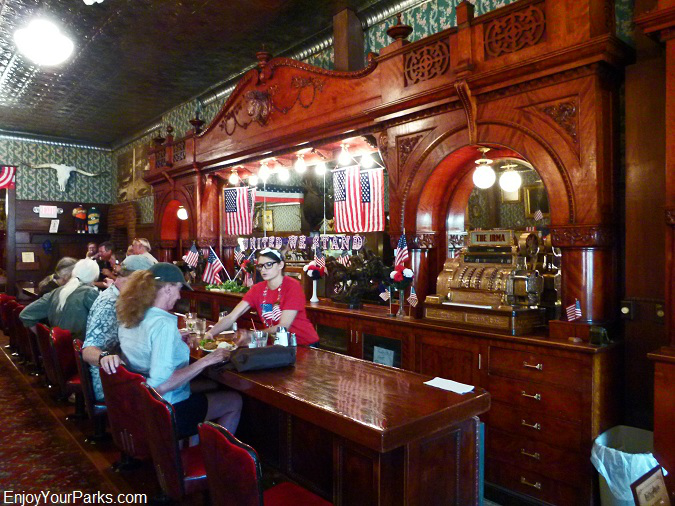 famous Cherrywood Bar was a gift from Queen Victoria during the Irma's construction, and was and still is one of the most well-known and photographed features in the entire town of Cody Wyoming. The Historic Irma Hotel is of course listed on the National Register of Historic Places, and remains a national western treasure to this day. The famous "Cherrywood Bar" in the Irma Hotel was a gift to Bill Cody by Queen Victoria of England. Every afternoon throughout the summer season, a really fun-to-watch gunfight re-enactment is held just outside the Irma Hotel in the middle of the street. This is a favorite among visitors, and you'll really enjoy the cast of characters who show up for the fight, including Buffalo Bill Cody!!! The Irma Hotel gunfight reenactment is always a treat for folks visiting Cody Wyoming. Located along the "main drag" of Cody Wyoming is The Buffalo Bill Center of the West, which is unquestionably among the finest western museum complexes found anywhere in America. This world-class museum center is home to six major museums, including the Buffalo Bill Museum, Whitney Western Art Museum, Cody Firearms Museum, Plains Indians Museum and the McCracken Research Library. Each of these facilities are absolutely world-class and without question a "must see" while visiting the Cody Wyoming Area. There are very few museum complexes anywhere in the country that rival this amazing facility. Once you visit the Buffalo Bill Center of the West, you'll understand why we are so passionate about you and your family visiting this American treasure. Montana and Wyoming, these historic buildings were saved from total delapitation due to the ravages of time. Each structure was carefully disassembled, move, and put back together at Old Trail Town by prominent Western historian Bob Edgar and his associates. Not only did they save these historic buildings from ruin, but they also saved their colorful history, which you can learn all about as you walk the boardwalks of Old Trail Town. Inside these buildings are thousands of authentic historic artifacts and furnishings that have been collected from these buildings, and there are also collections of several famous western figures, such as "Jeremiah Johnson", the legendary mountain man who spend years trapping in the Musselshell River Valley of Central Montana, and who became the sheriff of Red Lodge, Montana. Among the historic structures include cabins used by Butch Cassidy and the Sundance Kid, as well as the rest of the "Hole In The Wall Gang" during their wild days as western outlaws. 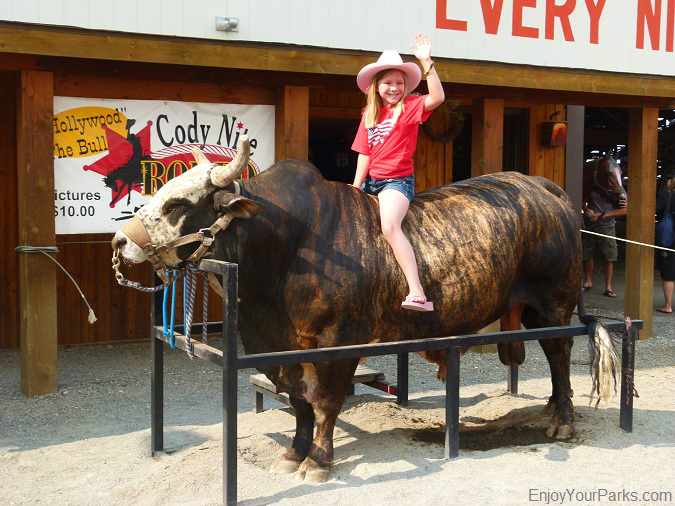 Cody Wyoming is known as the "Rodeo Capital of the World" because of the iconic Cody Nite Rodeo that is held each and every night throughout the summer season. This is a favorite among visitors of Cody Wyoming. 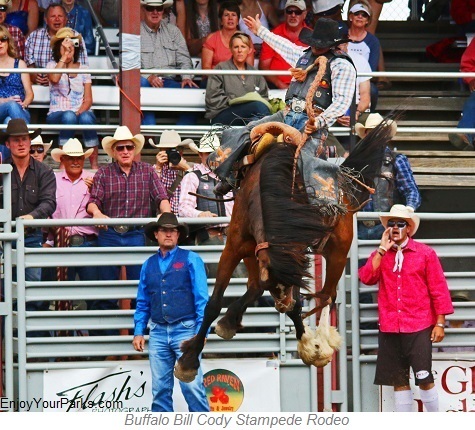 Another iconic event that is one of the most respected rodeos along the professional rodeo circuit is the Buffalo Bill Cody Stampede Rodeo, held July 3rd and 4th every year. 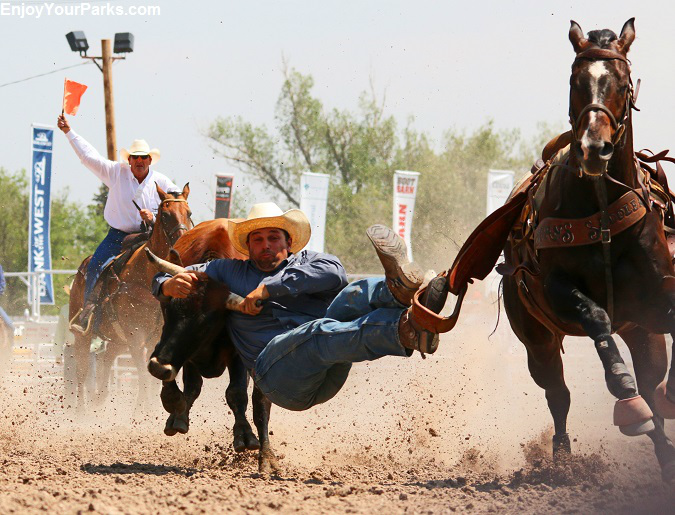 If you want to see a real western rodeo, then check out these rodeos in Cody Wyoming... and don't forget to buy your cowboy hat on main street before you head to the rodeo grounds! 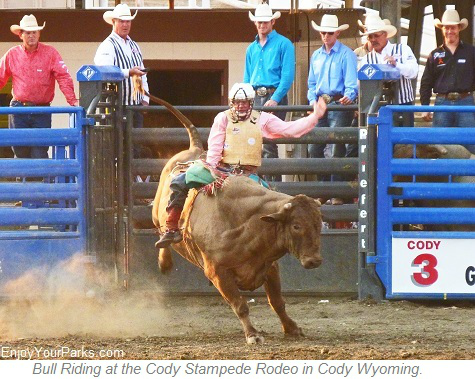 Young Bull Rider riding "Hollywood" at the Cody Nite Rodeo in Cody Wyoming. 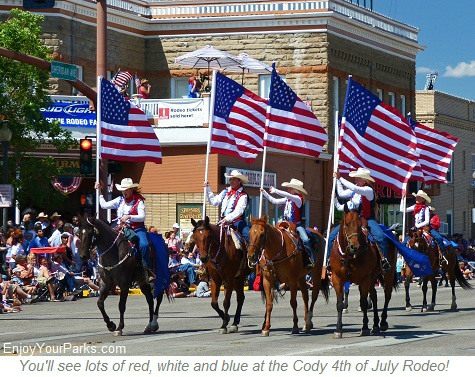 If you happened to be in the area during the 3rd and 4th of July, not only will you have the opportunity to see some of the top cowboys and cowgirls compete in the Buffalo Bill Stampede Rodeo, but one of the best and authentic 4th of July Parades found anywhere in the West roles down the main street of Cody. 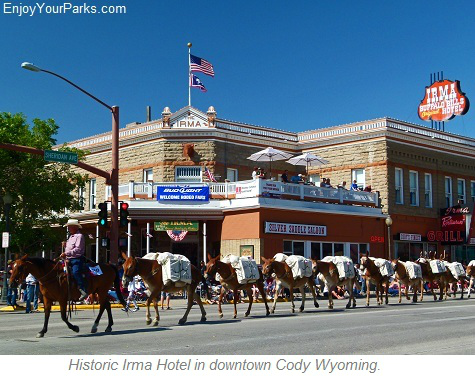 Passing by the Irma Hotel on its way down the historic main street of Cody, this is a classic western 4th of July that you and your family will really enjoy. It's as "American" as you can get. 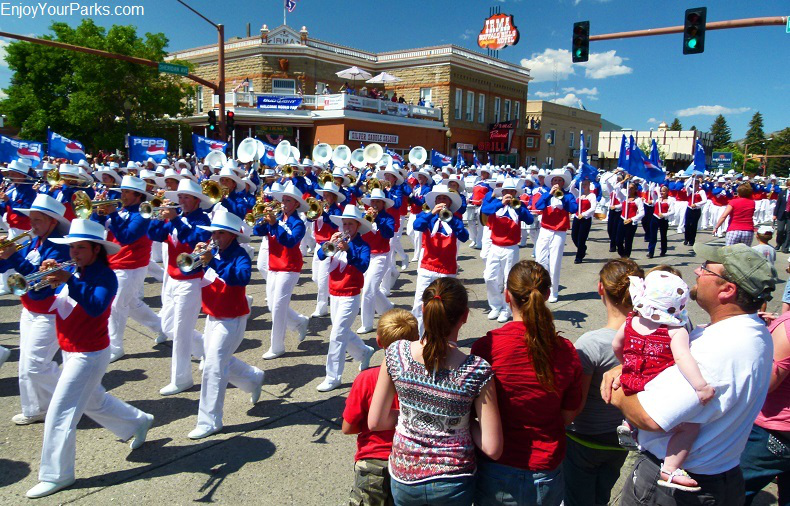 So if you and your family are near the Cody Wyoming area on the 3rd or 4th of July, we highly recommend that you take in this classic parade. 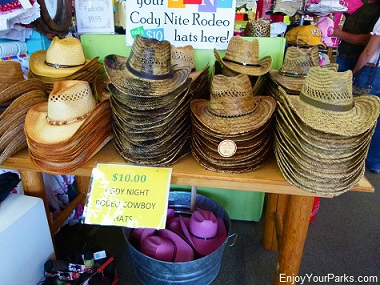 Don't forget to get your cowboy hat!!!! Ice cream Anyone? maintained on this Bureau of Land Management area. To see these amazing wild horses, head east on Highway 14-16-20 from Cody… to mile marker 72, which is about 18 miles from Cody. Horses seem to frequent this area. If no horses are present, keep driving to a kiosk and the Whistle Creek Road sign. Enter to your left and drive another 6 miles to “Pipeline Marker 75”. At this location you will have a wonderful view of the surrounding mountains, and this area is also where wild horses are frequently seen. Make sure to ask the Cody BLM office the condition of this road and if they recommend the vehicle you are driving to reach this location. 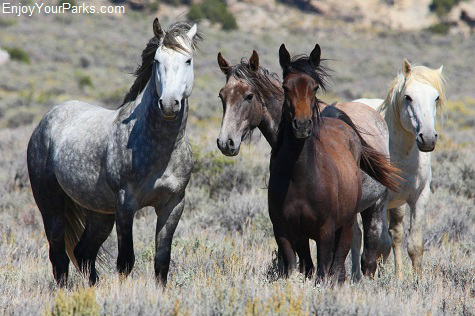 The color and size of the McCollough Peaks Wild Horse Herd is very diverse, ranging in colors from black, brown, bay, chestnut, sorrel, white, gray,buckskin and palomino, and pattern such as skewbald and piebald are found within this herd. The size of the horses vary from moderate to large. There are three amazingly beautiful scenic byways found near Cody, Wyoming. One is the Buffalo Bill Cody Scenic Byway, which leaves Cody and heads up the North Fork of the Shoshone River all the way to the East Entrance of Yellowstone National Park near Sylvan Pass. Along the way you will drive by the Buffalo Bill Cody Dam and Reservoir, Buffalo Bill Cody State Park, and the entire drive is extremely scenic, with towering mountains on each side of the road. Another scenic byway near Cody Wyoming is the Chief Joseph Scenic Byway, which is also incredibly scenic and ends up taking you to the Cooke City Montana and the Northeast Entrance to Yellowstone National Park. 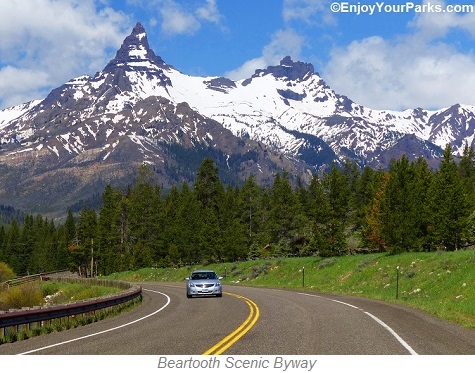 And the third scenic byway near Cody Wyoming is the Beartooth Scenic Byway, which takes visitors up and over the magnificent Beartooth Mountain Range, reaching an elevation of over 10,000 feet above sea level, and eventually takes visitors down the other side to Red Lodge Montana. The Beartooth Scenic Byway is regarded as one of the most scenic highways on earth. "Eastern Gateway to Yellowstone National Park"
Cody Wyoming is regarded as the "Eastern Gateway to Yellowstone National Park, as this classic Western town lies only 52 miles from the park's East Entrance. 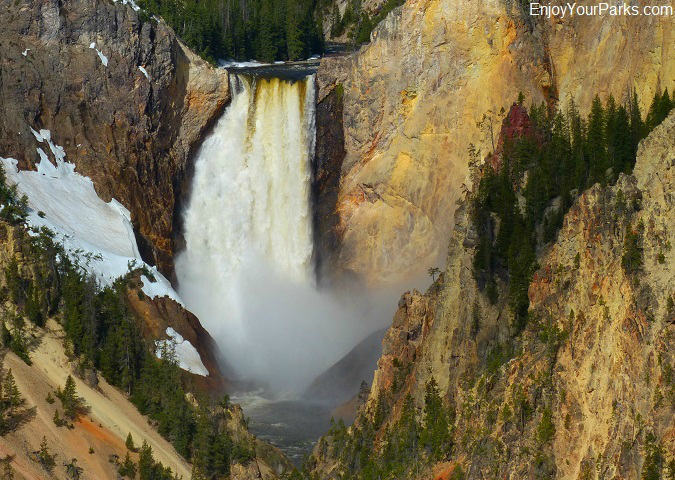 The route between Cody and Yellowstone National Park, whether it be via the Buffalo Bill Cody Scenic Byway or the Chief Joseph Scenic Byway, is a very popular way for visitors to enter America's First National Park.